BUILT ON A PRIVATE ISLAND OF 16 HECTARES. AMONG THE BEST CRYSTAL CLEAR BLUEWATERS OF THE SOUTH PACIFIC. 15 MINUTES FROM BORA BORA BY HELICOPTER SCENICFLIGHTS. POLYNESIAN TRADITIONAL ARCHITECTURE WITH MODERN COMFORT. VERYSPACIOUS SUITES OVER WATER AND ON THE BEACH. INCREDIBLE VIEWS FROM THEBUNGALOWS ON SUNSET/ BORA BORA AND TAHAA ISLAND. 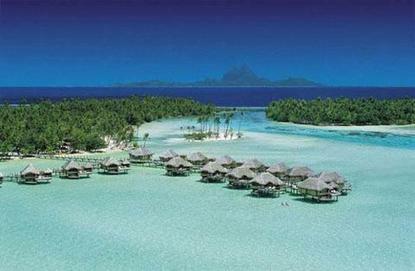 THE MOST REMOTE PRIVATERESORT IN FRENCH POLYNESIA VERY DISCREET FOR GUESTS LOOKING FOR RELAXATIONAND SERENITY. LOCATED ON A PRIVATE ISLAND -16 HECTARES- ACROSS TAHAA ISLAND AT 5 MINUTESBY BOAT.BOAT TRANSFER FROM RAIATEA AIRPORT TAKES APPROXIMATELY 40 MINUTES BY HOTEL BOAT AND SUBJECT TO CHARGE (4000XPF PER PERSON AND ONE WAY ONLY PLUS TAX). WE PROVIDE TRANSPORTATION FOR EACH ARRIVAL AND DEPARTURE OF CLIENTS. B PLUS NIGHT FLIGHTS ARRIVAL NOT RECOMMENDED.